This is the second part of a two-part interview with John Falk and Beverly Sheppard on their book Thriving in the Knowledge Age: New Business Models for Museums and Other Cultural Institutions. This post focuses on my favorite part of the book, in which Beverly and John argue that museums need to rethink their financial and programmatic relationship with their best customers--their members. I've written before about the problems with value membership (and innovations like 1stfans), and I was intrigued and challenged by John and Beverly's alternatives. One of the more provocative ideas in the book is the concept that members should not get free admission, but should instead get a set of elite perks that give them special status and opportunities at the institution. You talk about comparable programs like elite flyer programs. I love this idea, but I often find that museum staff are really nervous about making any changes that might alienate current members/donors. How would you recommend that museums transition in this direction? What will it take to make this happen? John: I think you sort of have to phase it in. Beverly did some interesting things when she directed Old Sturbridge Village to offer pricing schemes around opportunities for members only that were fee-based. The phasing in is beginning to communicate that being a member comes with privileges, but those privileges are not necessarily free. That said, at some point you do have to draw a line in the sand and say we’re going to move in this direction and start doing it. Beverly: What became so clear at Sturbridge was that our membership was really tuned in and loyal. Members are a group of people who have already bought in – they already like you. You’re spending a lot of money to serve them and not getting any more dollars after their initial payment to show for it. The first time we tried this, we offered an exclusive tour to members for $25 and it sold out immediately. Members told us they wanted more behind the scenes exclusive programs. We kept raising the price and they kept coming. We had families start clamoring to become members to gain access to special programs of this type. And it wasn’t just about money--we used every opportunity to deepen the relationship. Our intent was to give members a say in things, talking to them personally, what next, and they began to drive that program more. I also heard about an incredible experience like this from the Newark Performing Arts Hall. They started a new music program by targeting small groups of members with special shows and building up, to the point that now their audience for new music is huge. I think sometimes we focus too much on the creative things we are making--the programs or the exhibits--and we forget that the recipients of these programs want a personal, special experience. Members really want a special relationship--that's why they join. John: There are sort of three key ideas behind this. The first is going back to first principles. We have historically been in this industrial one-size-fits-all mode, not just for exhibitions and programs but for membership as well. Very few institutions take the time to appreciate that people become members for different reasons and have different needs. Second, a lot of people become members because of a sense of personal need and identity and a relationship with the institution. And yet there are very few institutions where if you took staff out on the floor, they could successfully point out which visitors were members and which were not. If these folks are your best customers and you can’t identify them, then you aren’t meeting their needs to be special because you don’t recognize them as special. And the third idea is around money. If you could treat people not as a number, and meet their needs, they would pay you for that! That’s what people want. By using a standard membership as a discount device, the institution commodifies the museum and communicates that the primary value of a museum is its price. This sells the institution short as well as the members. People are willing to pay if they feel they are getting something worthwhile. If you are just offering something cheap, you aren’t offering value. Beverly: If you start to do the numbers on what it costs to retain members and provide for them, you end up very often on the short end of it. Many families join on their first visit because it looks cheaper, but in fact all they got was a bargain to begin with and then it costs the institution to make all the repeated contact via newsletters, etc. One of the most challenging concepts in the book for me came under the issue of admission pricing. Following on Crawford and Mathew’s work on consumer values, you state that if the experience is superlative and truly satisfies visitors’ needs, people will not perceive price as a barrier. And yet you also talk about institutions that focus on providing free or low-cost learning experiences to visitors. Where do you feel museums fall in the experience economy, and how should they determine their pricing? John: The short answer is: With great difficulty. It would seem to me – and I have never been the ultimate decision maker when it comes to pricing – that it begins by working back to value. If value is this mutli-dimensional piece, you have to have clarity on what is the value you are giving to people. Museums are not things that anybody needs - museum experiences are not necessities like food, shelter, clothing. So then what is a museum’s value? How can we ensure that it is as great a value as possible? And what would it cost to have a comparable value any place else in a comparable way? So start there and reverse engineer what the price of the value is and you will arrive at a fair cost. I’d recommend this approach instead of doing a marketing survey and asking people what they’d be willing to pay. The place to start is to determine what you are and what you provide, and then the economic value should fall out of that as well (of course you also have to then deliver on that value to justify the price you’ve set). Much of this book is focused on high level analysis and discussion. But many museum professionals are not in the position to rethink their entire institutions. 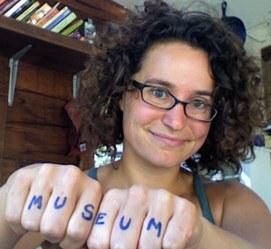 What do you recommend as starting points for museum staff who are not ultimate decision-makers? Beverly: There are probably lots of entry points. If I were someone whose responsibility has to do with orientation or front desk, I would get to know people coming in and ask them what people were coming in for. At Sturbridge there was one whole set of visitors coming in and asking “what can we do in an hour?” With this knowledge, we could put together floor staff and educators together to develop something for those visitors. Visitor service staff can also provide a personal greeting and recognition that there is interest from the institution in visitors’ needs. In education, it’s relatively simple to look through a gallery, observe people, figure out where do people gather, what reflects different visitors’ interests – and educators too could take on some of that role to customize the experience. I think designers can think about how we can individualize and design different types of exhibits that reflect the ways people learn, in groups and as individuals, at different stages with different needs. And so you can gather a lot of information and that can be a starting point. I also think everyone in the institution should be required to spend time on the floor. John: And if you want to ratchet it up to the next step, organize a discussion group and encourage conversations across the institution to talk about these ideas and debate them, and see whether they make sense in your institution. Try to engage administration in these conversations, and challenge them to be part of it. The book actually provides discussion questions at the end of each chapter expressly for this purpose. Beverly: The more we talk about these things and not get our feet stuck in the sand, the further we can go. Thanks to John and Beverly, and here's to keeping the conversation going! The pricing/admission examples discussed here are troubling. Certainly determining the "value" of an institution is paramount, but the notion of either ratcheting up prices or providing "elite" opportunities (for additional fees) seems like a recipe for creating a new set of economic barriers to museum visitation. Nothing could be more vexing than finding new business models for "institutions" especially those steeped in tradition and rituals. I am rushing out to get the book. It strikes me that museum users are values driven. So re-enforcing and investing in what they value: learning, exploring, handing down experiences and tradtions to their kids, will allow the cultural consumer to accept price changes or pay for upgrades. Great post. I agree with Paul. The raising of prices can create problems. The key thing is the creation of 'exclusive' deals, but these don't have to be expensive (or as high as possible). They're cheap enough to be accessible to all, yet encourage a sense of loyalty/commitment and privilege in customers. I think raising admin prices is kind of nuts. We need to look at Newspapers. They have spent billions selling subscriptions when they have never made dime one on a prurchase price. Museums are simply not too far off of this scenario. While there are probably many exceptions, many mid size museums spend well above what it costs to bring people in the door for every admission sold so I think making your $ on gate is foolish. What isn't foolish, or even elitists is offering quality programming at appropriate prices. If you have a summer program for kids, but take only 8 in the program, that can drive it as being a valuable program. If you give them a local artist to learn from for 5 days that can warrant a good asking price that is lucrative and not outrageous. Adult programs that offer important academic speakers, paired with exciting collection items could also garner a nice tidy price, and there is simply nothing wrong with that. Most museums are private non-profits. Non does not mean none. There are ways we can be more open (free admission for teens or extended visits for families, outreach to schools) that can guarantee access, while there can be smart programming that is providing value at the appropriate price. I think there are many interesting perks that cost the museum nothing and for with visitors will pay a premium for. For example, one of the perks for an "Ami du Louvre" is access to the line-free Richilieu entrance. It costs nothing to reserve one entrance for members and anyone who's been to the Louvre in July knows it's worth a fortune in saved time. Looking closer to home in New England, I've noticed a regional theater company has come up with a great idea. They invite their top donors (the Directors Circle) to participate in a lecture series by a well-known Shakespeare scholar. The donors pay for the privilege and apparently are delighted to do so. The lectures have value in and of themselves, bring together people with shared interests, relate to the focus and mission of the theater and raise money. Likewise a university museum nearby offers a guided art travel tours to its board members. Why not do the same for the general public and set a fair market value price? Or following the same model for in gallery public courses? It strikes me that museums have a unique opportunity to reach out to a segment of the population that wants to socialize around art and culture and is willing and able to pay for it. At the New York Hall of Science, members wear special admission stickers that identify them. We've encouraged our floor staff to welcome members. We even have a different colored sticker for our higher category members. This expedites their receipt of category-specific benefits, such as free admission to our outdoor Science Playground. Members experience this as special treatment; NYSCI staff experience it as a streamlined procedure. Members show their ID card when they first arrive and don't have to keep pulling it out during their visit.